Price: $134.00 (regularly $144.00) 7% Off! Hoover Dam Interior Tour: VIP interior tour of the inner workings of the dam and information about the history of its construction. 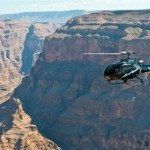 Helicopter Tour: After the Hoover Dam experience, guests are taken to the heliport for aerial views of Hoover Dam by helicopter. This 6-minute flight also includes views of the Colorado River and Lake Mead. Free Time: Time to explore the Visitor Center and upper levels including the observation deck. Total time at Hoover Dam is about 1.5 hours. Lunch: Guests will enjoy a meal at the Hoover Dam Lodge after their helicopter tour. 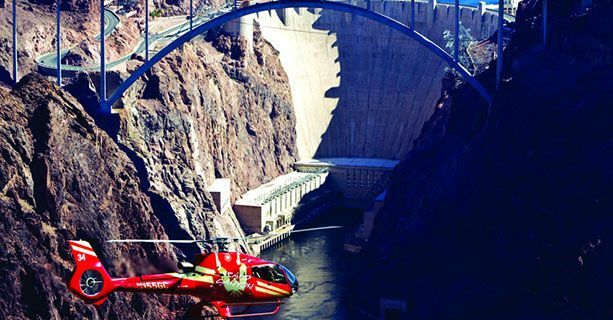 Experience Hoover Dam from two dramatic perspectives – from down within its depths to soaring above it in the sky. The experience begins with complimentary shuttle service from your Las Vegas Strip or Downtown Las Vegas hotel to the bus depot. After a brief pre-tour orientation, you’ll board a deluxe touring motorcoach and make your way to historic Boulder City, home of Hoover Dam. Along the way, your driver/guide will point out scenic and cultural highlights and provide information about the area. Upon arrival at Hoover Dam, a representative of the Bureau of Reclamation will accompany you on a VIP Discovery Tour that covers the entire lower level of the dam. The top of the dam allows you to truly be in two places at once – standing in both Arizona and Nevada. The design of this stately structure was truly ahead of its time, not only mechanically, but aesthetically. A monument to ingenuity, perseverance and bravery, the construction of Hoover Dam brought thousands of families to this arid and sometimes hostile part of the U.S. in hopes of escaping the economic hardship of the Great Depression. You have to opportunity to learn their stories with a short informative video presentation in the movie room. You’ll also be taken down to the generator room and be shown the incredible infrastructure that creates power for several surrounding states. There will be plenty of unstructured time to explore the Visitor’s Center and shop for souvenirs of your tour, as well. Next it’s off to the Papillon heliport where you’ll board a state-of-the-art touring helicopter. Witness the immensity of the Hoover Dam and the winding Colorado River with the incredible bird’s-eye view afforded on this flight. The approximate flight time is 6 minutes round-trip with headset narration. When your flight is complete, you will be taken to the Hoover Dam Lodge to enjoy a meal before being transported back to your Las Vegas hotel.